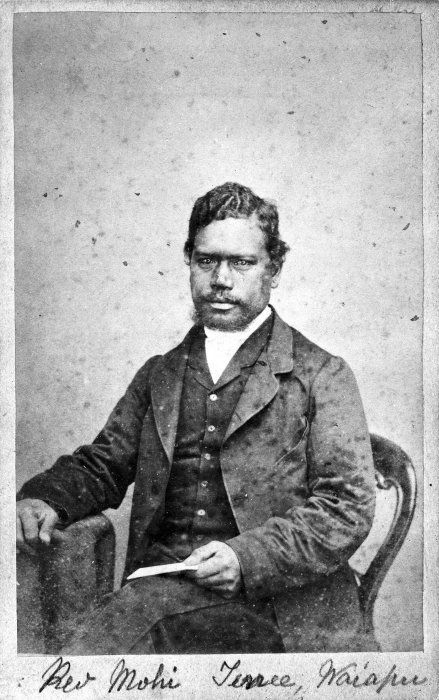 The Rev Mohi Turei (1830-1914) – noted Ngāti Porou leader, orator, writer, composer of haka, traditional carver, teacher, and Māori Anglican Priest. Over the last few days I’ve been in San Francisco at a joint meeting of the American Academy of Religion (AAR) and the Society for Biblical Literature (SBL). As a Māori Biblical Scholar, I’ve long been interested in the way that the Bible is taught and interpreted internationally, and the SBL in particular is the place where you can ‘put your finger on the pulse’ of biblical studies teaching around the world. More than 6000 biblical studies teachers and lecturers gather at the SBL Annual Meetings in the U.S. (not to be confused with the separate SBL International meetings held elsewhere around the world, and usually numbering 100-200 in attendance). The AAR expands the numbers at this conference by a further 2000. Some days of the conference you can choose between more than 200 different sessions and presentations by biblical experts from all over the world. Part of the reason I attended this year was to present on Māori approaches to interpreting the bible, and I counted it a real privilege to be able to do so. The other reason was to meet & greet a little – like all conferences, often the most valuable part is what happens ‘in-between sessions’. You get to talk, even if only briefly, with lecturers and staff from all of the best universities and publishing houses from all over the world. Immediately after my presentation, I was approached by four Deans with personal offers of Ph.D programmes, and I’ve had a further six by email since and an additional offer to get my presentation published. Great, I suppose, if personal advancement is your thing, but a little proof also of the potential that such meetings offer if you are looking for opportunities to further your studies, and increase the quality of the teaching that you provide. More important to me was the opportunity to see just how we stack up, in terms of biblical studies, against the rest of the world. As a teacher and academic leader, I have a strong desire to offer world-class courses and opportunities to our people at home. They deserve nothing less. Sadly, I note that in all our educational talk and activity at home (and by ‘our’ I mean the Māori Anglican Church and the Anglican Church in general), there seems to be strong downward pressure on academic rigour and quality. The College of St John the Evangelist in Auckland, where I gained both a B.Theol & M.Theol, no longer offers degree courses onsite, and is trending towards ‘practical ministry training’ instead of higher academics. In the Māori arm of the Church, where I head both a local ministry education provider (Taapapa) and a Centre for Biblical Studies, there is even greater ‘downward pressure’ away from higher academics and more towards vocational, non-assessed courses. This is, in part, a play towards our broader constituency at the grass-roots level, to provide ‘easier access to learning’ for mature, often second-chance learners, who don’t have the time, energy, or inclination for research and graded assignments. Broadly speaking, the conversation in our bureaucracy (of which I am a part) has been one that derides ‘academics’ as esoteric and irrelevant, and maintains a suspicion of academic discipline, such as assessment and examination, as an unjust ‘Western model’. The end result is that we are not, and will not, produce the kind of high-end scholars and scholarship that we need to advance Māori biblical studies and Māori theology as a whole. Put more simple, we are not producing the kind of deep thinkers we need – people who are experts in their field, and able to write, teach, and argue their case, while maintaining real and genuine connections with the grass-roots of our church. All of which leads me to the man in the picture at the top of this post: The Rev Mohi Turei. Mohi Turei was a Ngāti Porou elder, steeped in the traditional knowledge and education of his people, and a devout Anglican clergyman. He was an outstanding writer, composer, orator, and teacher. He was a grass-roots product – steeped in his own language and cultural knowledge, having spent years as a student at the traditional learning house of Te Taperenui-a-Whatonga. He also studied as a clergyman, taking classes at Te Rau College in Gisborne, learning basic Hebrew and Greek as part of his study of the Bible, as well as Church history and practice. He took notes in lectures, studied English books, wrote essays, and sat exams. More than this, Mohi Turei was a deep thinker, and this shows in his composition of Haka such as Tihei Taruke, which contends eloquently for the studied merging of Māori and English knowledge and religion. I know that pure academics can often be farcical – esoteric, educational-puffery with no relevance to real-world praxis. But that’s academics at its worst. Academic study at is best is when it leads to knowledge that has depth and quality, and is tried, tested, and true. In the same way proper flight-training produces good pilots, proper academic study produces good teachers and deep thinkers – people who can teach, write, share, and inspire. Just like Mohi Turei. My goal is to become something like Mohi Turei and the many others like him that we share in our Māori Anglican heritage – disciplined learners and deep-thinkers unafraid of melding ‘Western’ knowledge with our traditional cultural understandings. More than that, I hope that the programmes that I lead will eventually produce many more like Mohi Turei. To do that we must become ‘deep-thinkers’ – curious seekers, questioners, life-long learners, and yes, academics in the best meanings of the word. Before God spoke, He hovered. Before He uttered, He meditated. Before He acted, He thought deeply. Proper academics, in my opinion, is thinking deeply. Processing, testing, and coming to the right conclusion. We shouldn’t be afraid of deep-thinking, because we serve a deep-thinking God. The funny thing is, by running away from academics, we are running away from the best of what we were – leaders and scholars like Mohi Turei. To move forward, we might need to look back first, and remind ourselves of the great heritage and the great potential that has always been ours.